GREER, SC (courtesy ngu.edu) — North Greenville University held a ceremonial unveiling of the new street name leading from Poinsett Street to the school’s Tim Brashier Campus at Greer on Friday, July 20. The street, formerly Ryans Corp Drive, is now named Walter Brashier Drive in honor of Dr. T. Walter Brashier, the graduate school’s namesake. 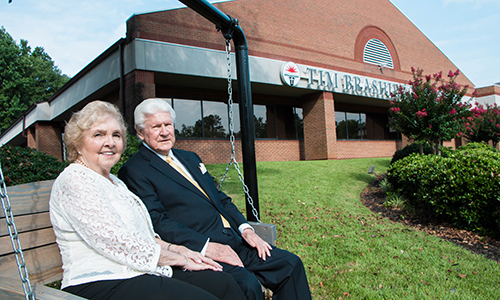 Brashier and his wife, Christine, have been two of the most generous and faithful supporters of NGU. Their generosity to the university has spanned over four decades. Their first commitment was a downtown Greenville office building in the 1970s. Since that time, they have started an undergraduate scholarship fund, supported several capital projects, given the lead gift to launch the T. Walter Brashier Graduate School in 2005, and served on several university committees, boards, and councils. Classes began at its first site, the former Fairview Baptist Church building in Greer, on February 6, 2006, offering two graduate degree programs in business and Christian studies. The graduate school now offers eight graduate and two doctoral programs, and is home to 450 graduate, online students, and the PA Medicine program at its Tim Brashier Campus at Greer. In addition to the unveiling, President Fant announced that the university will be launching new academic initiatives such as certificate and professional training programs and new degree programs that will launch this fall and in January of 2019. Also, Brashier has allowed the university to expand the Martin Timothy Brashier Scholars Program, announced last year, to include all of the programs offered in Greer. “This program substantially subsidizes qualified and approved applicants as they start their degrees with NGU and have already been a great boon to these programs,” Fant said. To be considered for the scholarship, a student must be a resident of any Upstate county or graduate of NGU, a first-time undergraduate, graduate, or doctoral student, must have applied and been accepted to attend a qualifying program at the Tim Brashier Campus, and must earn and maintain a 3.0 GPA. The Tim Brashier Campus at Greer honors the memory of the Brashier’s beloved son, Tim, who passed away in 2012. A businessman and a 1976 North Greenville alumnus, Tim Brashier left many memories and significant impact in the lives of those who knew and loved him. “We are grateful for the generosity of Walt and Christine in this legacy, which is now a landmark location here in Greer,” said Fant. Scholarship application deadlines for Fall 1 Term is July 31, and September 30 for Fall 2 Term. For more information about eligibility requirements for the Martin Timothy Brashier Scholars program, visit www.ngu.edu/martin-timothy-brashier-scholars-application. For NGU’s graduate and online degree opportunities, visit www.ngu.edu/academics.